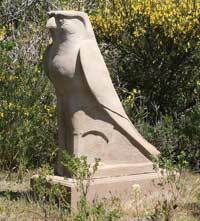 A likeness of the Egyptian god Horus stands sentinel in a remote location on the slopes of Marin County’s Mount Tamalpais ( photo P. Pasquini). An Egyptian-style statue tucked into the dense forest of coastal scrub, chaparral, poison oak, bush monkey flower, and various species of grasses and forbs and of course the villianous Scotch broom on a slope of Mount Tamalpais has authorities scratching their heads. The four foot tall, 300 lb concrete work of art depicting ancient Egypt’s sky-god Horus faces due west and gazes directly at the 2,475-foot mountain’s peak. A brush-clearing crew from the Mill Valley Fire Department stumbled onto it in August, and even now, city officials are mystified as to the statue’s origin. The Mill Valley Police Department contacted celebrated artist Phil Pasquini (head of City College of S.F. Sculpture Dept) for assistance. The artist checked museums both locally and beyond, but was told all of the Egyptian exhibits were intact. As a veteran of the occasional Stash-it-On-The- Mountain-Under-Cover -Of -Darkness adventures, I want to know if they (or she) had to use the “Egyptian technique” (rolling a thousand-pound thing on wooden dowels, this is how Charlie moved his multi-ton machine tools into the shop all by himself), and maybe who dunnit! Mill Valley officials are asking “why”? It’s in a remote location inaccessible by automobile. It’s beautiful. And if the artist had tried to go thru the “proper channels”, there would never be a statue there. The era of big rock work on Tam is over. There’s the famed ampitheatre and the Fire Lookout. Don’t forget the missing twenty vertical feet of the East Peak (scraped away by Army Corps of Engineers/idiots who wanted to discourage peak baggers). On a much smaller scale, there’s the music stand (it’s on the maps) and now this cool falcon god……who knows WHAT ELSE is up there? I have met women in their nineties who told me of living up at the Potrero Meadow (Dept. of Redundancy Department, sorry) during the Depression. They claimed that up there in the tent-city, life was a blast. I can imagine that the statue was erected around then…possibly even cast in place! Now none of our reader riders would harm this elegant long-kept (Rosicrucian?) secret, so it is up to you to explore Mt. Tam on your own, off-trail of course. Leave the mystery be. And watch out for the ticks. ~ by jacquiephelan on November 14, 2008. I always though Marin was for the birds. BTW: We got another award in Boulder last Friday. Woohoo! I’m glad you enjoyed the article about Horus on Mt. Tam! So glad the Marin County Open Space Dept, or the Calif State Park, or the MMWD havn’t called for its removal!! Many thanks for leaving a commentary on my blog. It’s been a great great surprise. WoW!! You’re impressive, really!! I’m seriously thinking of writing an entry on “Alice B. Toeclips”; maybe you can give me a hand? I’ve already got you on the list so I’ll KEEP visiting your blog, not only to improve my English (I’m a translator when I’m not a cyclist, don’t tell anybody! Shhhhh! ), but also and specially to learn about you and your world. Congrats!! !, also for your newly elected president. I went to the horus site and the statue has been removed 😦 Stolen?… or removed by offieals? I don’t know, but only part of the base remained. FYI, the Marin Open Space District distroyed the statue. Such a shame. To them artwork = garbage. If it were up to them, nothing human (roads, vital water supplies, indian relics, etc) would exist on the mountian. This is a good example of the environmentalists which are making pleasurable and beautiful things like that statue, impossible to enjoy these days. Shame on them for distroying art. If someone were to find a picasso nailed to a tree, they would shred it.